Did you ever try and grow a hyacinth in your kitchen? If so, you certainly remember how fragrant a single bulb is. 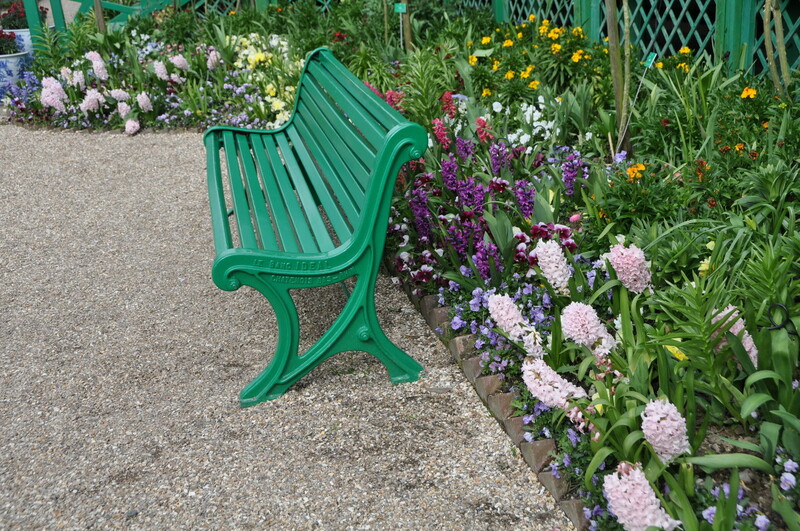 So imagine being seated on this green bench in Monet’s garden, wrapped by the scent of hundreds of hyacinths… This is an early April rapture at Giverny. 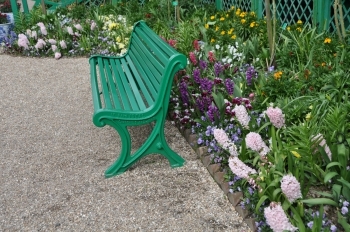 The brand of the bench, le banc idéal – the ideal bench – has nothing to do with the floral wonders of Giverny. But it sounds appropriate, doesn’t it? 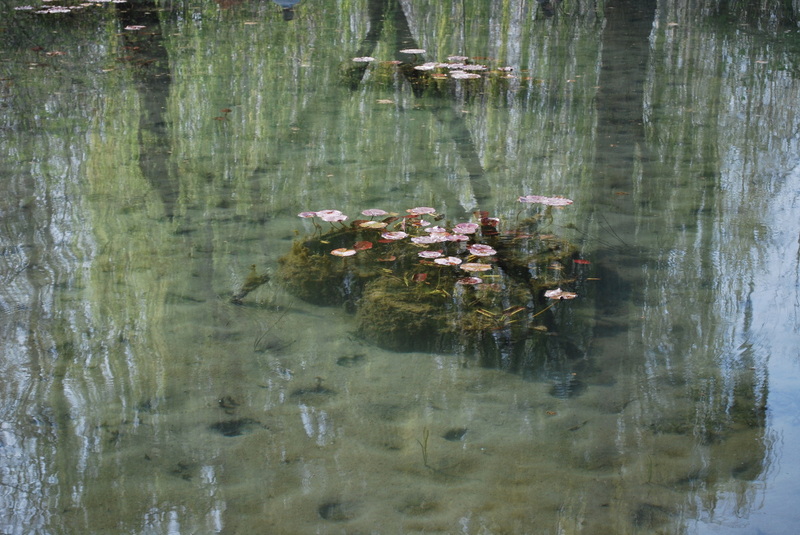 Although the water garden designed by Claude Monet still looks very peaceful, everybody is working hard at Giverny. 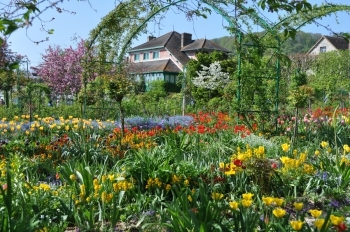 The Fondation Monet (his home and gardens) as well as the Musee des Impressionnismes Giverny reopen in ten days, on Friday, 25th March. It is earlier than normally, because Easter is especially early this year. 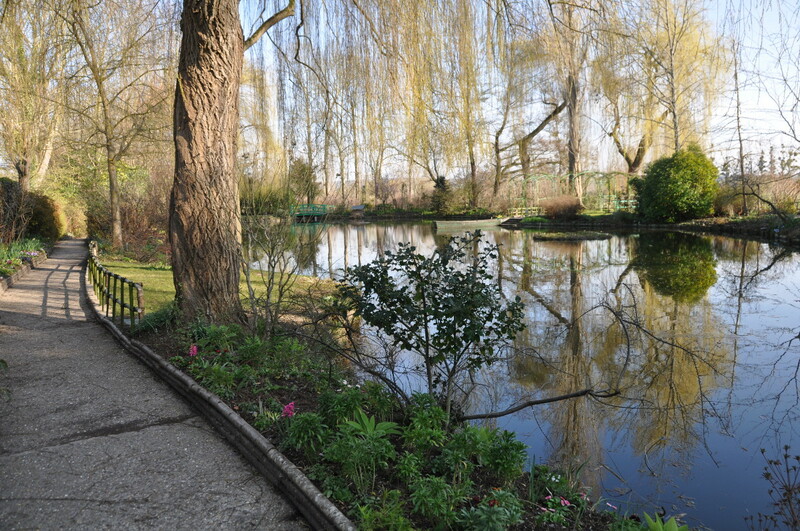 Just out of the Winter, the gardens are not overloaded with flowers, yet pleasant to walk around. They look fresh and shiny. 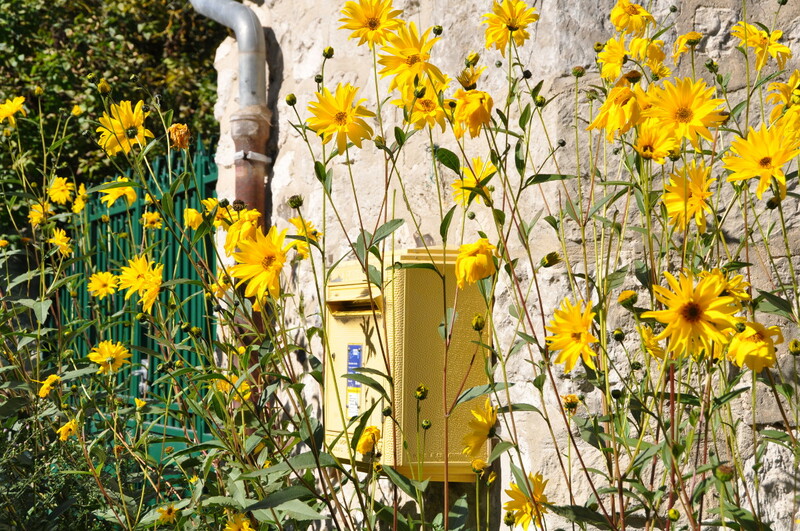 The first signs of Spring can be noticed. 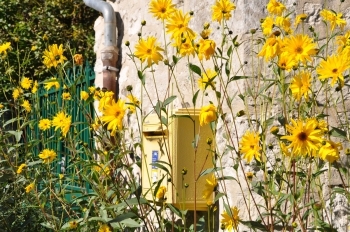 Jonquils are already out, illuminating special spots with their bright yellow. I took the picture above this afternoon. The Musée des Impressionnismes will display an exhibition of works by Gustave Caillebotte. 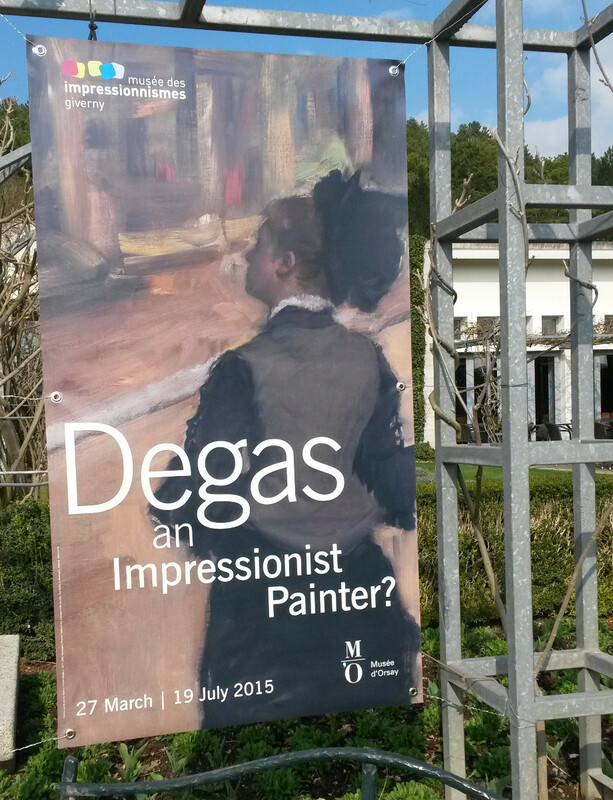 This hugely talented impressionist was a keen horticulturist. 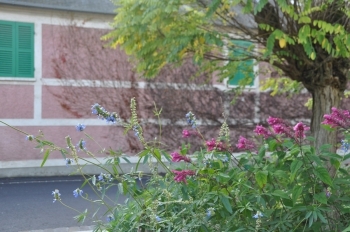 His garden and rare flowers were among his favorite motifs. 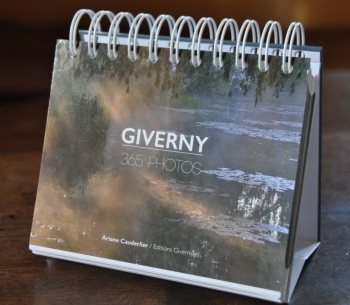 This is big and good news at Giverny: a bakery has opened! 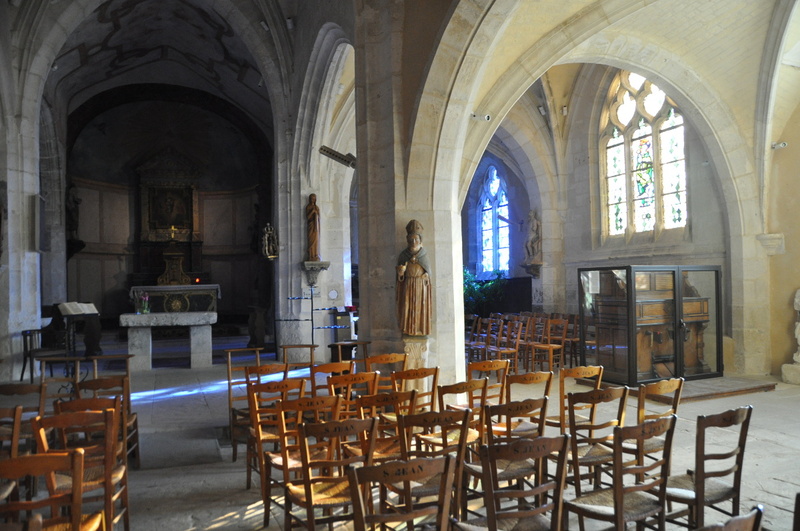 It is located in the main street rue Claude Monet in the direction to the church on number 73 Bis. The last one closed decades ago, so it is a joy to see a bakery again in this little village of 500 inhabitants. Nothing means life in a village more than a bakery and a school. The bakery’s name, Au coin du pain’tre, is a pun. 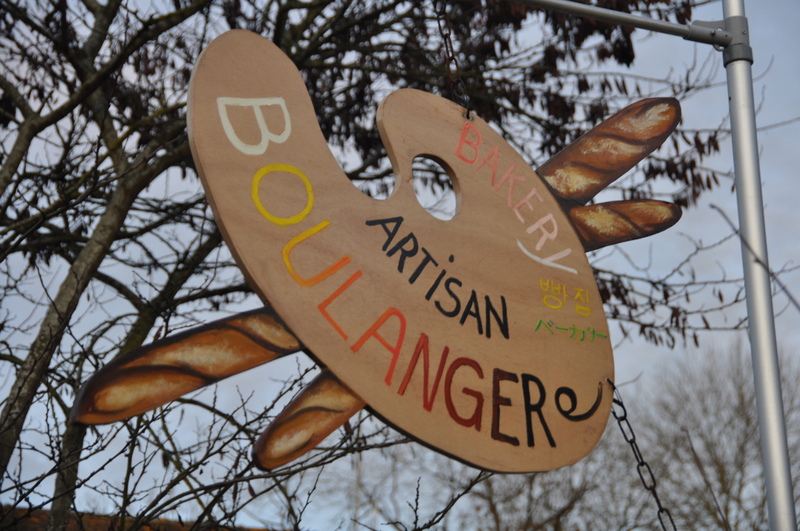 Au coin du pain would mean To the Bread’s Corner, but with an additional ‘tre ‘ it reads To the Painter’s corner, an allusion to the painting destiny of Giverny. Logically, the shop sign is in the shape of a palette. 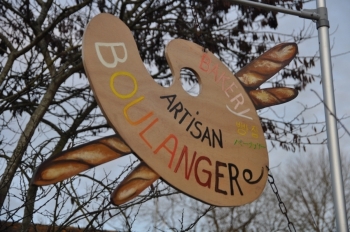 Artisan boulanger means that breads and pastries are home made. When the museums are open, so is also the bakery, 7 days a week from 7.00 am to 8.00 pm. The bakery is established in a lofty shop that used to be successively a garage for renting 2CV cars, an antiques shop, and lately a restaurant. There is room enough for tables and a nice walled terrace, where the Coin du pain’tre also serves light meals. 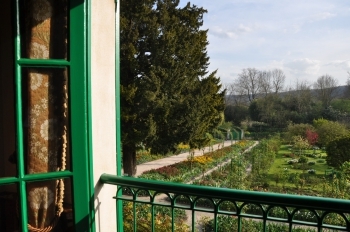 This picture was taken in one of the bedrooms of Monet’s home at Giverny. The house dates back to the mid-1800’s and most of the fixtures are still original, so I suppose this window handle is too. It is a very common model that can be seen in lots of houses of that time. Here it is painted the same pale blue as the window. What is certainly much more recent are the curtains, although they look ancient and charming. 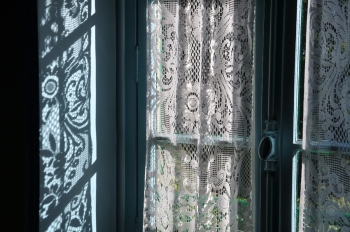 But it is rare to find old curtains in good condition because the light and heat behind the window damage them rapidly. I suppose those were replaced at the restoration of the house in the 1970’s. They are machine made with sort of a floral pattern that resembles lace. When I was a child I wondered. How can a curtain let us see through, but not enable people standing outside to peep in? Now I don’t any more. I take them for granted. 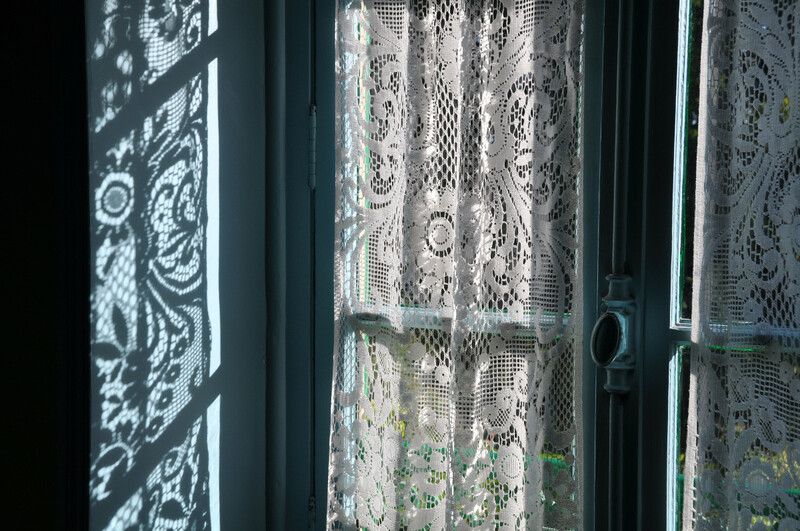 A new surprise awaited me: I’ve realised since I work as a guide and chat with foreigners that curtains, especially lace curtains look french. Do you agree? They also look country, in my opinion. I must confess that I am a big fan of the Country Living magazine, both the US and UK issues. It is very exciting to explore the country spirit overseas. To learn what people answer to the question ‘What makes my home country?’. Here the curtains would belong to these features. 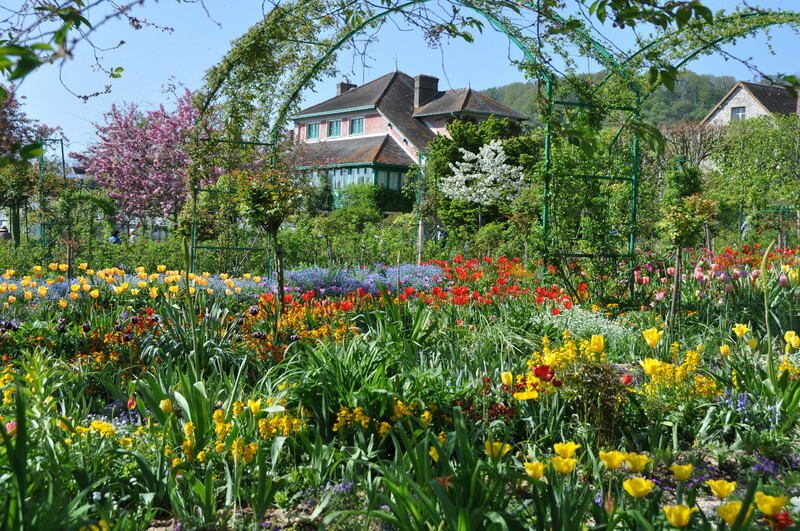 Monet’s house is at the same time a painter’s house, a house of the 19th century, the home of an upper-middle class family, and, being located in the country side, it is definitely a country house. 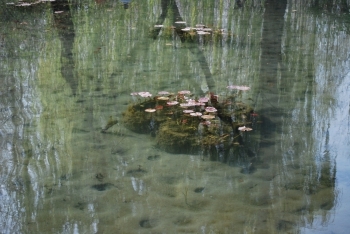 This is what Claude Monet could see when he gazed through his bedroom’s window in April. 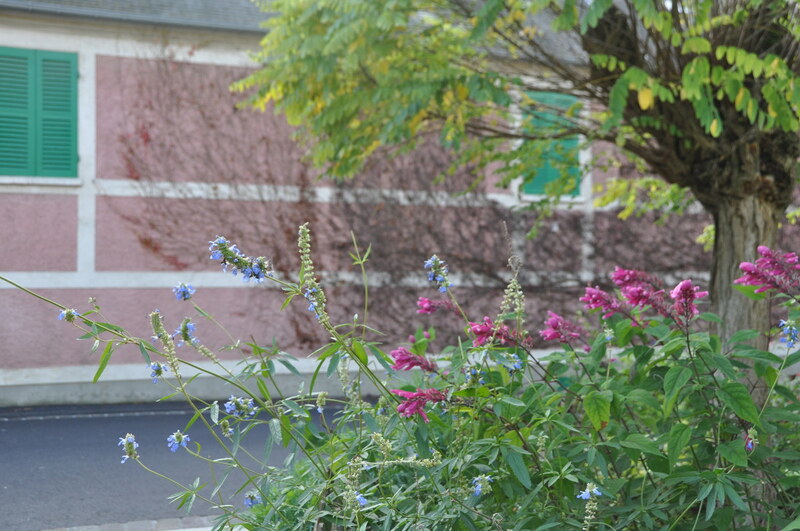 Last year spring was very early and the first colors were already there at the opening of the garden. Wallflowers make a striking effect combined with tulips, while daffodils and jonquils form islands of white and yellow flowers on the lawns. 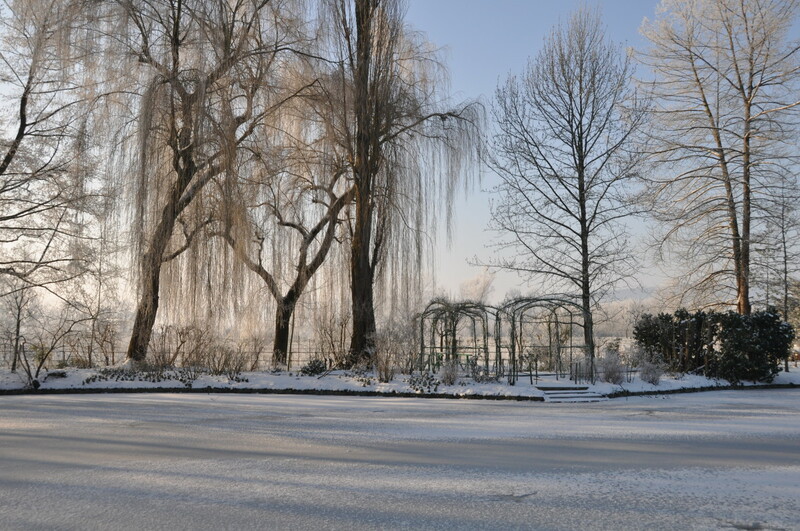 In the distance, the tall trees of the water garden don’t have any leaves yet. It is just a matter of days. This picture was taken on January 1st at Giverny. Outdoors, under a mistletoe plant growing on a tree. Mistletoe is extremely common in our area and can be seen on a wide range of trees including poplars, apple trees, aspens or oaks. 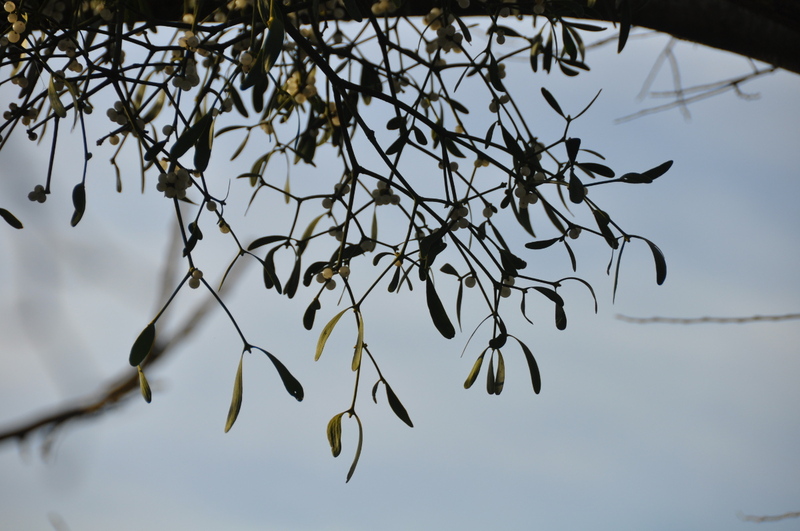 As long as the leaves don’t hide it, mistletoe is very visible and puzzles many visitors. It is a parasite and it does kill the branches it grows on by being too greedy, but the tree itself generally resists. In the meanwhile, mistletoe offers bed and board to many birds. It is now considered an ecological keystone species. As a guide, I was recently asked by a client if we also kiss under the mistletoe on New Year’s Eve. Actually, we do sometimes, although I doubt this habit belongs to the French folklore. But because we love kissing in France, any excuse for it is immediately adopted, of course. However to tell the truth, the clock striking midnight is enough to start the kissing party. 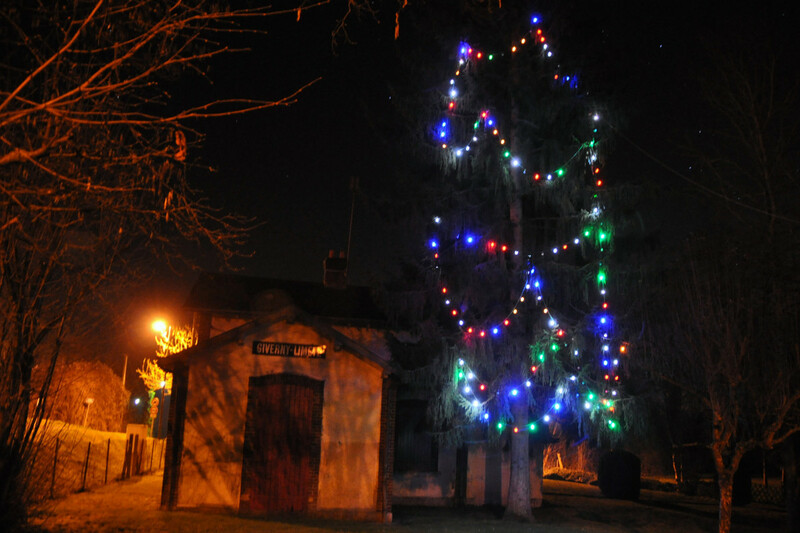 I wish you many opportunities for kissing this year and twelve months full of love, friendship and warmth. Have a wonderful year 2015!